Suppose you have a data set with values hovering around 13, with a range of +/- 20%. The entire packet width is 5.2. Now suppose you have another data set with values hovering around 3, with a range of +/- 20%. The entire packet width is 1.2. Does this suggest that the second data set is more steady than the first? The graph shows the 13 quarter standard deviation of GDP growth since 1947. Data is from this FRED page, Gross Domestic Product, 1 Decimal (GDP), Quarterly, Seasonally Adjusted Annual Rate, 1947-01-01 to 2013-01-01. GDP growth graph can be seen here. I like 13 because it’s a Fibonacci number, but it’s also the duration in quarters of the current remarkably stable GDP growth, so let’s see how it works over time. Yes the standard deviation is dropping like a rock for the last 5 quarters. It dropped like a rock from 1952 to 57 [with three separate stages that were each comparable to what we are seeing now,] from 1961 to 1965 in two stages, and from 1984 to 88 in two stages. It always drops after a recession – sometimes like a rock and sometimes in a more leisurely fashion. The reason that the bottom values were higher in those earlier periods than what we’re seeing now is that the GDP numbers were bigger. A red line connects most of the local minima. A parallel green line is rather arbitrarily projected from the 1991 maximum. An orange horizontal line is projected forward from the 1999 minimum of 0.46. The standard deviation stayed in the range of 0.47 to 0.48 for the next three quarters. Along with the last two quarters of 2006, at 0.47 and 0.45, respectively, these are the 6 quarters since 1947 with lower standard deviation values than the current 0.53. The current value is, in fact, only at the mid range of the trend channel. A purple horizontal line is projected forward from the 1988 low of 0.90. The reading immediately prior to the current one, at 1.11, was above that level. So we find the current reading is the 7th from the lowest on record. Only now with the last reading, has the standard deviation fallen low enough to enter a range of values at or below 0.90 that includes 33 of the preceding 100 quarters. I think the really remarkable thing about recent events is the steepness and height of the climb from mid ’08 to mid ’09, caused by the great recession. The precipitous fall from Q1, 2012 is just one more reversion from an extreme. Not everyone shares my fascination with trend lines, and you can certainly quibble with the width of the channel I’ve drawn. But I think there are two indisputable facts. 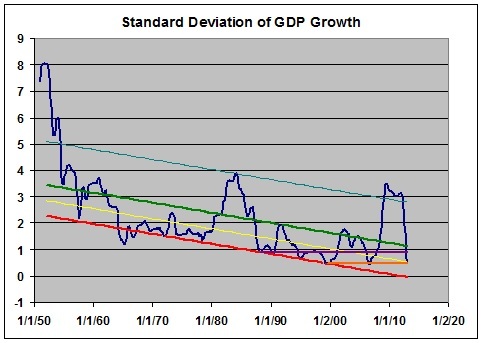 1) The standard deviation of GDP growth has been trending down since the end of WW II. The rate of decrease has been far lower in the great moderation than it was prior to 1965. 2) The current value of the standard deviation is not in any way remarkable over the last 25 years, or even the last 50 if you accept my trend line view. It’s certainly possible that the standard deviation will continue to drop for the next few quarters. But it can’t fall below the lower trend line, since it has already crossed the theoretical minimum of 0.00. It’s also possible that we’ll slip into another recession and the standard deviation will balloon again. The main thing to understand is that recessions cause the standard deviation peaks, and that the second most effective way to have a low standard deviation is to avoid recessions. The first most effective way is to have remarkably low GDP growth. In my view, this is not remarkable stability. It is the American economy enduring a slow and agonizing death. There’s another more nuanced way of looking at the data that we’ll get to it in part 3. 1) Try using quarter on quarter changes at an annual rate instead. By taking standard deviations of year on year rates of change you’re removing a lot of the volatility. Taking 13 quarter standard deviations of quarter on quarter annual changes reveals that the standard deviation of the latest 13 quarter period is 1.22 which is the third lowest on record.The first and the second lowest on record immediately preceded it in 2012Q3 and 2012Q4. I also tried it with periods of 12 quarters in length (I like the number 13 also but a whole number of years is slightly more conventional) and the last four are the lowest on record with the 12 quarter periods ending in 2012Q2 and 2012Q3 having standard deviations of 1.02 and 1.08 respectively which is substantially lower than at anytime in the last 30 years. It’s true that NGDP variability has come down as NGDP rates of growth have slowed. But the first thing is a good thing and the second is not a bad thing within reason. And although NGDP variability has declined at the same time that the average rate of change in NGDP has declined, that doesn’t exclude the possibility that you can have one without the other. A better way of putting this is the most effective way of avoiding recessions is to reduce NGDP variability. NGDP variability is correlated with recessions and to the extent that one believes that the central bank is able to reduce NGDP variability it should do so. Every recession since World War II except the 1974 recession occured when NGDP growth dipped below 0.9% in a quarter at an annual rate. The recession of 1974 is perhaps the only clear example of an aggregate supply shock (the oil embargo) recession. Every other recession was caused by a shock to aggregate demand (NGDP) which the central bank has control of. In fact it is through NGDP that most modern central bank target inflation. The rate of inflation is simply the residual between the rate of change in NGDP and the rate of change in real GDP (RGDP). Thus lower rates of change in NGDP mean lower inflation rates. However given nominal rigidities there are real costs to very low rates of inflation. Most intermediate macro textbooks say an inflation rate between 0% and 4% is ideal. Assuming potential RGDP grows at an average rate of 2.5% thus an NGDP growth rate of between 2.5% and 6.5% should be ideal. The middle of that range is 4.5%. Scott Sumner has proposed a 5% NGDP growth rate target. Christina Romer has proposed a 4.5% growth rate target. 1) Is the the proper data series for what you recommend? 2) I agree, to a point. Sure it should, but can it? The Fed Funds Rate is 0.11, and we’ve had unprecedented open market operations. The claim I’v seen is that policy has been inept. What should they have done? Can you point me to a concise treatment of this issue? This strikes me as being inside out. Only maybe and only to a point. There’s no specific driver here. We haven’t been above 4.5 since the recession ended and the trajectory over the last year is down. I don’t see anything good here. Re: 1) That’s RGDP. I thought I had NGDP. Do you know where i can get the NGDP data, or how to manipulate the NGDP numbers to construct quarter on quarter changes at an annual rate? There is a progressive death taking place. The talk about NGDP targeting seems designed to stop this death. But the root cause behind the death is the progressive loss of income share by labor which is driving demand downward. And NGDP targeting is designed to increase demand. But I still do not see how NGDP targeting will reverse the trend of falling labor share. I have this graph that shows the natural rates of interest for labor and capital are diverging since the early 80’s. The problem is that the natural rate of interest for labor is nearing 0%. This is driving down inflation below the 2% target not just in the US. This graph shows inflation falling in the G7 countries. How can NGDP targeting raise labor’s share of income? The mechanism to transfer the excess liquidity of capital to labor has broken down. GDP growth is dependent on labor’s power to demand products with income. 2) Can you point me to a concise treatment of this issue? Volumes have been written on this and views differ.I doubt that I can find something concise that isn’t also biasedor too simplistic. Central banks don’t have direct control of the inflation rate. They have the ability to move the aggregate demand curve (AD) which is essentially NGDP. The inflation rate is dependent on where the AD curve intersects the aggregate short run supply curve (SRAS) which in turn is essentially a Phillips Curve. That’s not usable. I got the data from table 1.1.7 at BEA. BEA Table 1.1.7 is the rate of change in the GDP implict price deflator (e.g. inflation), so no. NGDP is Table 1.1.5 but there is no rate of change table. Now, put your cursor just to the right of “Units:” just beneath the graph. I followed your instructions and the chart looks just like what Jazz has presented already. Be careful, on the drop down menu “% Chg. from Yr. Ago” is just above “Comp. Annual Rate of Chg.”. If choose that by accident you will get Jazz’s graph. The non-usable data was at econograph. They code it to make it non-usable except to subscribers. I got the recommended FRED graph and data from your 2:11 pm comment. I’ll use it in part 3. BTW, Derp is a technical term. Don’t misuse it.